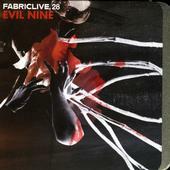 The Fabric of Evil (Nine) is weaved by Tom Beaufoy and Pat Pardy, the English duo behind the breaks labeled act of Evil Nine. I call them labeled because this is not a breaks compilation in any sort of traditional sense. This mix weaves through a litany of genres with breakbeats being the only common thread throughout. A veritable potpouri of styles are built into the mix: breaks, electro, eletroclash, indie rock, techno tinged punk, acid house, innovative synths and squelches. Really, you name it and it's probably there. Staying true to their name, the basslines are dark and nasty and help bring the beats into focus or better focus. The problem with most break records is the formula; they get repetitive or they sound so dissimilar from track to track that they sound disjointed. The Evil Nine boys manage to avoid that pitfall by employing genre changing segues that weave the tracks together into an eclectic party tapestry. These segues usually involve acid & techno-fied indie tracks and they showcase some of the most innovative producers on the scene along the way. Producers like Switch, Justice, Riton, and Digitalism. Standout tracks include Mystery Jets' The Boy Who Ran Away (Riton Extended Dub) which has an anthem punk feel to it and a very french wave synth breakdown for destroying the dancefloor. Along those same lines, Digitalism's Highway To Paris remix of Daft Punk's Technologic builds slowly and then breakdowns into a really fun electro house take on the vocodered vocal and synth of the original. But the real gems on this mix are found late with Justice's radical and simply brilliant reworking of indie rock scion's Franz Ferdinand's The Fallen, this one has to be heard to be believed. Is it a breakbeat track? I couldn't really say, but it is the life of the party. As is Digitalism's punk electro take on the now defunkt London punk outfit Test Icicles' What's Your Damage? which literally blows the mix up over shrieking vocals and screaming synths. From there, the breaks slow with an Adam Freeland remix of B-Movie and crash with The Clash's London Calling, as the boys bring their evil take on FabricLive back to their home and somehow when you get there you realize, it all made sense.